Quiet solitude and outdoor adventures—Bluestone National Scenic River offers you plenty of both, along with an opportunity to explore the beautiful scenery of southern West Virginia. Coursing over the blue limestone from which it gets its name, the Bluestone cuts a 1,000-foot gorge through the Appalachian Mountains. This ancient gorge and river system is preserved as an unspoiled living landscape that serves as home to one of the most diverse ecosystems in the southern Appalachians. The Bluestone National Scenic River extends along a 10.5-mile stretch of the Bluestone River nestled between two West Virginia state parks. Today, visitors looking for adventure can enjoy hiking, biking, hunting, and fishing along this pristine river ecosystem. Outdoor enthusiasts and casual adventurers alike will find the Bluestone Turnpike Trail a perfect fit for an outdoor day trip. This 9.5-mile trail meanders along the river’s bank, following ancient footpaths used by the Cherokee and Shawnee in the 17th and 18th centuries. Along the way, the trail passes the former town site of Lilly, a once thriving town abandoned during the construction of the Bluestone dam. 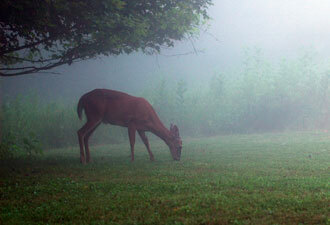 The turnpike offers visitors peaceful solitude and opportunity to spot wildlife such as black bears and wild turkeys. From this trail, you can hike or ride a bike to Bluestone State Park. Plan ahead, and join a knowledgeable park ranger on a guided hike to learn about the area's history and diverse environment. Late in the season, visitors can enjoy fall colors and cooler temperatures. Boaters can paddle the calm waters of the Bluestone River from Pipestem Resort State Park to the spring at Bluestone State Park—a particularly enjoyable float in spring and early summer. You'll find river access points at both Pipestem and Bluestone state parks. At Pipestem, visitors are treated to a panoramic aerial view of the gorge as they descend via cable tram to the valley floor. For a more challenging trip that includes rapids, experienced rafters can put in above Pipestem Resort State Park. Set up your own shuttle between Pipestem and Bluestone State Parks or contact local companies for shuttle services. Driving directions and resources to help plan your trip are available on our website. 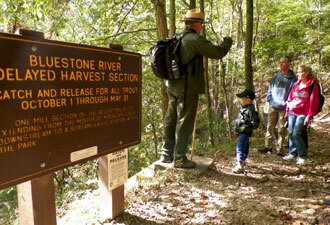 Hunters and anglers should feel at home at Bluestone National Scenic River! The Bluestone is well known for its superb warm water fishing. Anglers with a West Virginia fishing permit can catch bluegill, smallmouth, and rock bass from access points along the Bluestone Turnpike Trail. 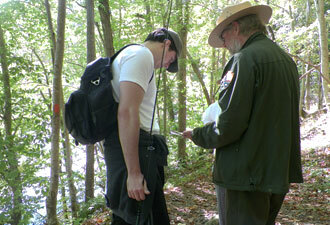 Hunting, administered by West Virginia Department of Natural Resources, is permitted in most areas of the national scenic river. This pristine habitat supports the highest density of wild turkeys on the east coast as well as other game animals. Whatever level of adventure you seek; young and old alike can get away and enjoy nature and outstanding scenic views on the Bluestone National Scenic River.